Inside out is a global street art project initiated by the French artist JR. The project transforms human identity into art. Vigorously simplified, large photos of people gathered into a gigantic mosaic of images in the town scape. The event in Borås is a so called ”group action” – a specific local happening, independent but approved by the Inside Out-project. People in and from Borås are photographed and during the No Limit Street Art festival photos are mounted to a mosaic somewhere in the city under the watchword ”We see you”. – Inside out is a really exciting project with an important message that has gained a lot of attention and proliferation globally. We are happy to include a local version during No Limit. It creates a symbiosis between local anchoring and commitment with the international street art scene in a very positive way, says Stina Hallhagen, project manager of No Limit Street Art. – With “We see you” our aim is to create a piece of art together with the people of Borås, a piece where its us, the inhabitants of Borås in focus. Through the tales of people we reveal each other. About every fourth of the inhabitants of Borås has parents that are born in another country or are born in another country themselves. This are experiences that are not shown enough today. We want to rupture the myth that you must have a textile worker or a peddler in the family to call be a ”real” inhabitant of Borås, says Elin Stavåsen Brokvist, ”We see you”. Inside Out is a large-scale participatory art project that transforms messages of personal identity into pieces of artistic work. Everyone is challenged to use black and white photographic portraits to discover, reveal and share the untold stories and images of people around the world. These digitally uploaded images are made into posters and sent back to the projectʼs co-creators, for them to exhibit in their own communities. Posters can be placed anywhere, from a solitary image in an office window, to a wall of an abandoned building, or in a full stadium. These exhibitions will be documented, archived and be made available online at http://www.insideoutproject.net/. The INSIDE OUT project is a creation of the artist JR, recipient of the 2011 TED Prize (watch JR’s TED talk here). 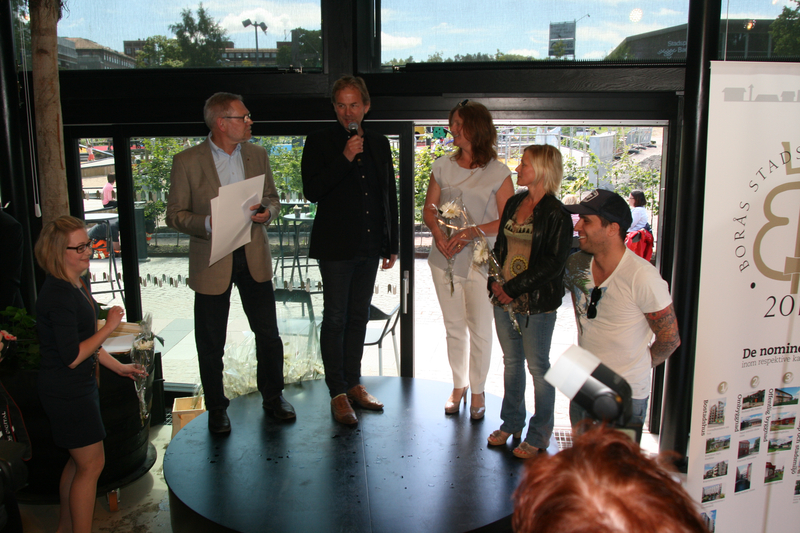 No Limit Street Art today was awarded with the municpality of Borås prize for urban and landscape development, during a prize ceremony in the brand new Orangery in the heart of Borås. The award is held every three years and points out good examples of architecture and urban development. in the town of Borås. – I´m happy, proud and a little surprised. When we started working with No Limit I guess none of us could imagine that it would lead to such a recognition and a prize for urban and landscape development. I´ll really be a neat duty to spread the happy news to the artists and the buildning owners and I really hope that they will credit from this, each and everyone of them, says Stina Hallhagen, project manager of No Limit Street Art. – Besides that many people love the art that was created during No Limit, this perhaps is the finest review a street art festival could get. It really shows what art in public spaces can achieve. I´m honored, happy and thankful of beeing a part of an entirety that could make such positive change to the townscape in a city, says Shai Dahan, curator of No Limit Street Art. The No Limit Street Art festival has been such appreciated that the city has decided to keep the pieces for several years to come. With imaginative paintings on the facades the festival adds a stimulating new dimension to the town scape. The pieces of art contributes to a strengthened interest for the city room.